It was Thursday, so by now I knew my group well. The group’s snorkeling ability couldn’t be more diverse. Some are experienced and competent in the water. One, fearless and funny, who started with no snorkeling experience, during her second week yells out “Tortuga, Tortuga” on our dives as she searches through the waters looking for the biggest tortoises swimming by. My group inevitably rushes to her side. There’s the one with her own wet suit, not the one borrowed from the boat, which made me believe she was an accomplished snorkeler until, as we left the boat for our first snorkeling adventure, she asked, “What if you’ve never done this before?” It seems she borrowed her sister’s wetsuit, and was more than a little afraid of the water. My answer, "Then, it will be your first time" didn't seem to phase her. Indeed, by Thursday, that was behind her; adventure was her only objective. Another, also on his second week, is an all around athlete; he herds cattle, flies planes and was a natural underwater, especially when it came to taking outstanding photos of the marine life and sea lions around us. I thank him for the still underwater photos attached with this post. One couple has traveled the world snorkeling everywhere they go. He has the most sophisticated underwater camera equipment I’ve ever seen and videos and films for his company in Germany. His camera sits in a self-contained floatation device that keeps it upright and he can direct it or let it sit under the water, taking pictures and videos on its own. 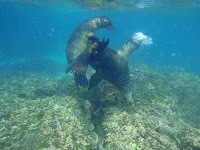 His videos are included in this post, but you can see even more footage underwater as well as remarkable video of our week together in the Galapagos Islands by searching Aqua Surround on You Tube. The videos are beautiful and really tell the story of what you can hope for when you come to this special Paradise. As I said, I was leading a very diverse group indeed! 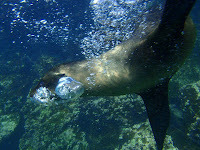 Yet I knew that despite this variance in skill, I had it in my power to make this one of the most memorable and joyous occasions of everyone’s trip to the Galapagos Islands. If you’ve read my earlier posts, you know that I grew up on the Galapagos Islands, have been diving since age 11 and am a certified Dive Master with more than 6000 Scuba dives of my own. How many times I have myself snorkeled in these waters I can’t imagine. As a naturalist and representative of our National Parks my responsibility is to the Islands’ conservation, but as the leader of my group, my responsibility is to them and my desire is to bring unforgettable moments. My plan was first to visit the beautiful pristine shores of the beach at Gardner Bay (for more about Gardner Bay, follow this link to my blog post about this gorgeous beach), then to snorkel in three different locations nearby, knowing that each has its own hidden treasures, though I saved the best for last. The beach did not disappoint. 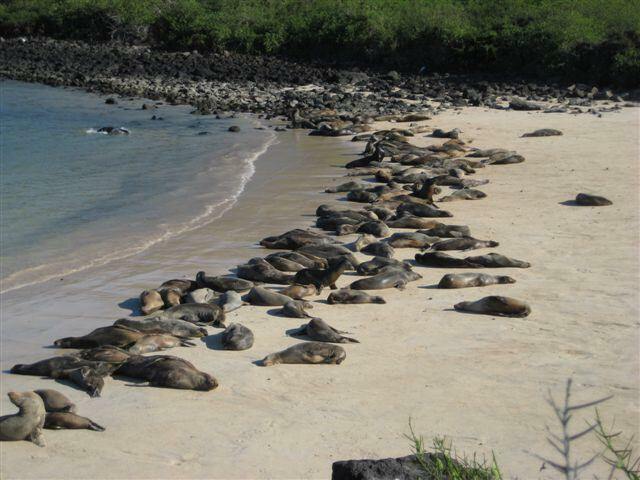 Literally hundreds of sea lions lounged on the beach. We saw them up close and personal. We watched baby pups cavorting, moms feeding their babies, and large males strutting. We heard the commotion they make even as they laze in the sunshine. 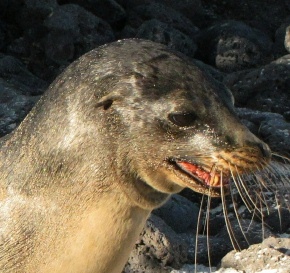 Sea lions are gentle and unafraid. The babies come right up to us and beg for a little rub, but we can’t oblige them because our scent on a pup will cause a mom to reject him. Along the shoreline, they swim and romp in the shallow waves and roll around soaking up the sand and sun. My group does the same, except for rolling around in the sand! We had marvelous photo and video opportunities before we set off for our adventure in the water. Go here to see actual video from that morning. 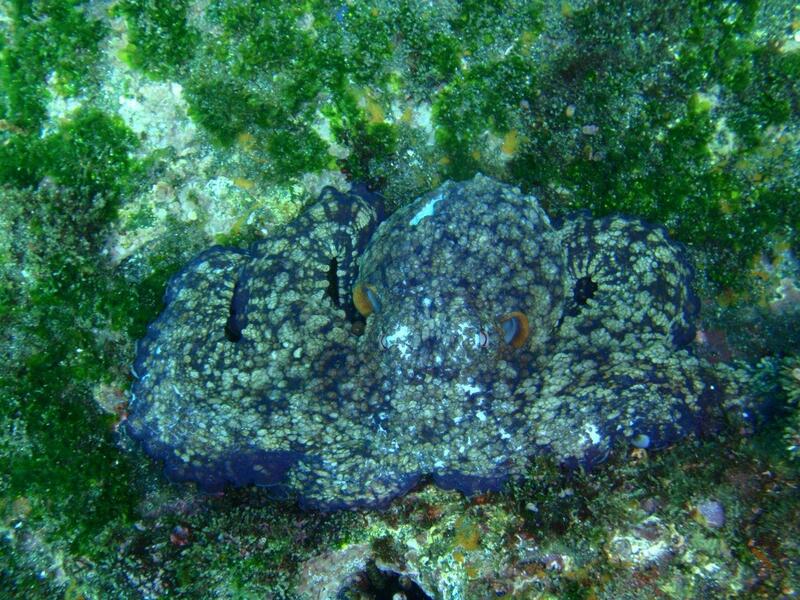 Once we started snorkeling, we saw rays and sharks, schools of bright blue fish, king fish, yellow-tailed sturgeon fish, and angel fish. But the fun had just begun. And, before we knew it, we were in a cave swimming with the sea lions, each and every one of us having the time of our lives. At first, I kept my group close. As I spotted the first sea lions, I yelled out, “Sea Lion! Sea Lion!” Everyone hurried over for the best view. 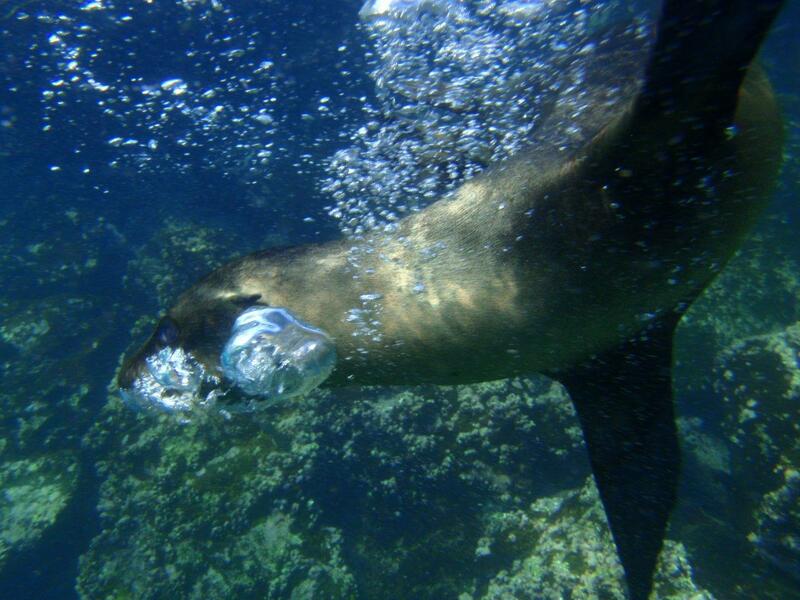 Here we were – in a cave in the pristine Pacific Ocean, on a perfect morning swimming with the sea lions. Who could ask for anything more? I could and I took the experience to a whole new level for my group. They watched as I dove down into the water for a long underwater swim with the baby sea lion pups who followed me like they were my own kids. I dove; they dove. I twisted and twirled; so did they. I went into a cave; they followed. Under a reef, they played peek-a-boo. The more I played at their games, the more rambunctious they became. And, seeing the fun, more pups and adult sea lions came to join us. Soon, everyone was joining in the fun. Sea lions of every shape and size surrounded all of us wanting to play. They dove, they twirled, snaked and rubbed their bodies around us and nuzzled and touched us. They frolicked and played. They nipped and bounded at each other like any puppies at home. We reached out and touched them and they were unafraid; they bumped their little noses against us. They just wanted more. Their faces were adorable and compelling; their eyes were engaging and seemed even to twinkle. They appeared to smile and stare us right in the eyes and dare us to engage in a game of follow the leader. They beckoned us for just a little more play time. Their happy barks joined our own laughter. Soon, many of us were barking with them. Each and every one of us hated to leave them. Fortunately, my aforementioned expert underwater photographer memorialized these moments in truly magnificent underwater footage from Aqua Surround. 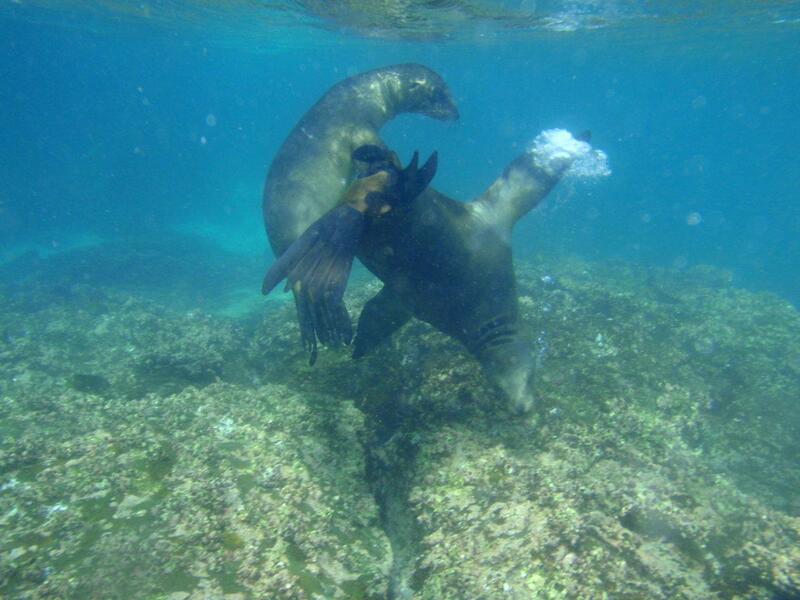 Click here to see the antics of swimming with the sea lions. Nothing can compare to swimming with the sea lions. I promised my group a thrilling and memorable day and I delivered. I was as happy as they. It was, once again, a little piece of Paradise. I had the pleasure of swimming with dolphins a couple years ago and I too loved it. Being so close to the animals you realise you share many similar traits. Sea Lions seem like such fun and playful animals to be around, and so trusting. I'm truly jealous of your experience and thanks for sharing it. 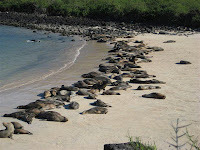 Leaving for the Galapagos next week.......Can't wait!!! !